Here's my card for today's Clean and Simple Challenge (CAS164 - Spotlighting). It's my first time trying this technique. I wanted to use a black, white and red theme ... and I thought my Elements of Style stamp set would work really well for this technique. This is made with all SU! products - hope you like. I stamped the rose branch in StazOn black onto two pieces of watercolor paper. One was mounted onto the card base of Basic Black, and the other I watercolored using re-inkers diluted with a little water and my small brush. 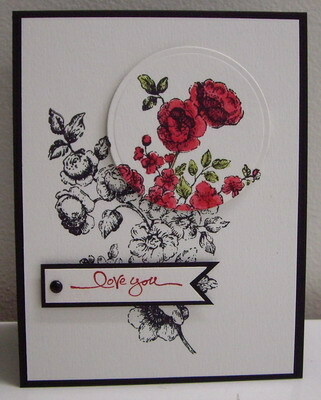 I punched out the circle from the watercolored rose branch and mounted it on top of my card front, lining up the image, and popping it up to add depth. I stamped the sentiment in Real Red ink onto watercolor paper. I used the square punch and punched the end of the strip on the diagonal to created the "V" for the banner. I repeated this with the Basic Black frame for the banner and then mounted the sentiment on top. I punched a hole and added a mini black brad to the sentiment, then mounted it to the card front, popping it up with dimensionals. Last week was busy and I'm a little behind, so today I'm posting my card to honor Sylvia (sillyfilly on SCS) for her reign as "Queen for the Day" last week. Congrats Sylvia!! She has a gallery full of beautiful cards and she is always so supportive with her comments to others ... this is a well deserved honor!! I chose this card of Sylvia's to CASE in her honor. I only changed up the colors and the main image ... leaving the overall design and layout the same. Hope you like. 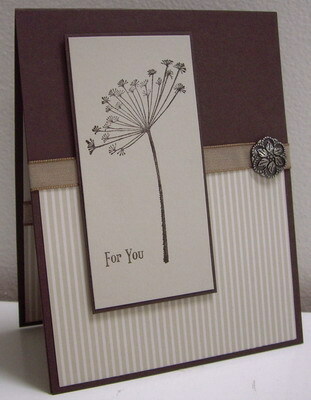 I stamped the Silhouette Spray in Early Espresso ink onto Sahara Sand cardstock. I stamped the sentiment in Early Espresso as well. I cut the image to size and mounted it on a thin frame of Early Espresso cardstock. On the card front of Early Espresso, I mounted the striped Sahara Sand DP to the bottom, punched a hole on the right hand side for the brad at the top of the DP, and wrapped the seam binding around and secured it at the back with sticky strips. I added the brad over the ribbon and threaded it through the hole. I mounted the card front onto the card base of Early Espresso so that the ribbon would be secured between the two layers. I mounted the main panel to the front of the card, popping it up with dimensionals to add depth. 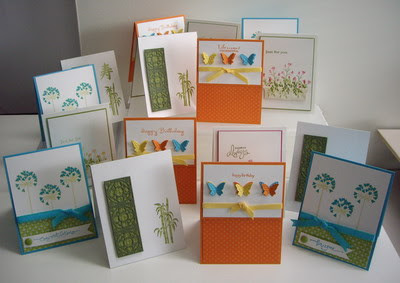 Finally, I'm posting a picture of the cards made at a workshop I held yesterday. Everyone had a good time and left with four lovely cards each. Thanks to Aileen, Stephanie, Sally and Fran for joining me in the studio yesterday!! And thank you girls for the wonderful treats you brought for us to enjoy - you are so sweet! !